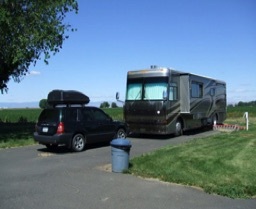 Well, we do have a home - pictured here, a 2002 Alpine that is 37 feet in length and our “toad” a 2004 Subaru with a very essential top carrier for the golf clubs. It may be smaller than yours, and it moves from place to place, but it is home. My pillow is on the bed, our towels are hanging by the shower, I trip over the cats in the morning getting their food, I cook and wash dishes in the kitchen, we eat in the dining room, watch TV in the living room, and barbeque on the patio. And one of the best parts - if the neighbors turn out to be unpleasant, we just move! As to why - well, that is a little harder to explain. We had a wonderful example in watching Barbara's parents do this for a number of years during the '80s. It was such fun to get telephone calls describing a little out-of-the way place that they had found with great pies (Barb's dad could spot a place with great pies just driving down the street), interesting local characters and beautiful sunrises and sunsets. They even did MUSEUMS (much to Barb's surprise - dad didn't do that when she was growing up) but most of all, they enjoyed being together. The second reason is a promise we made to each other while Barb was undergoing chemo - that as soon as we were able, we were going to take the time to enjoy life and each other. After Dave's stroke in 2000, we took a good look at the calendar, did some figuring and looking at our finances, and put summer 2006 as our target date. So after 40 years of moving from one college campus to another, always working more than we should, we've arrived at the point where it is time for just us. We’ve made arrangements to stay in touch with family - this blog is one example, we have an aircard for the computer (that’s how things get posted to the web) and cell phones for each of us, and we check in at regular intervals. Where did you come up with this idea to just travel around seeing the country? Are you really not going to have a home?